The sun has not yet set on Donald Trump’s first week as President of the United States, and already he has made good on several major campaign promises. He has signed executive orders that pave the way for the forceful restructuring of the ACA, begin construction on both the Keystone XL and Dakota Access Pipelines, and divest from the Trans-Pacific Partnership. 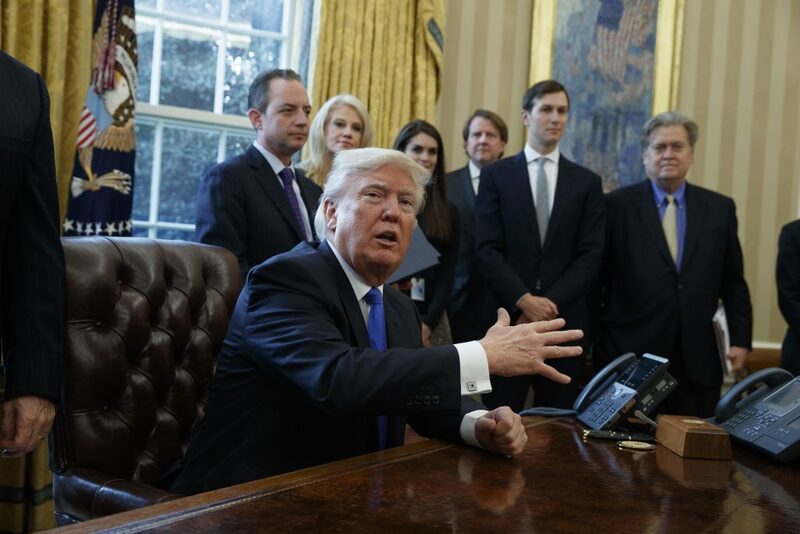 He has reinstated the “global gag rule” on abortion, and met with executives from major manufacturers to threaten to levy a “border tax” on them if they don’t staff locally. He has pledged to sign the anti-LGBTQIAP+ “First Amendment Defense Act.” He has forced just about all government agencies to undergo a media and financial blackout until the transition to his staff is complete. And as this is being written, Trump is set to order sweeping changes to our already tight immigration policy. The AP learned this from senior administration officials that remained nameless. “Later in the week, the president is expected to restrict the flow of refugees to the United States. The proposed plans include at least a four-month halt on all refugee admissions, as well as temporary ban on people coming from some Muslim majority countries,” the AP said. Across the country, municipal and state governments are emboldened by Trump’s nascent iron fist. In eight states, bills have been introduced to criminalize protest. In Louisiana, resisting arrest is now a hate crime. And in the belly of the beast, Washington, D.C., six journalists are facing felony riot charges for covering the Inauguration Day protests in addition to the dozens of demonstrators arrested and charged during the day. Tomorrow, people of conscience face a crossroads. We’ve come to that crossroads earlier than perhaps we were ready for. We have said all throughout the campaign season and in the months leading up to the election that if Donald Trump was elected president and enacted even a fraction of his ideal immigration policy, we’d be there to stymie him in some way. We need to keep our promise. However that needs to happen, we need to keep our promise. No collaboration. No rationalization. No normalization. When Trump signs his executive order calling for a southern border wall and immigration restrictions on Muslims on Wednesday, those of us who advocate for open borders must be ready to fight.